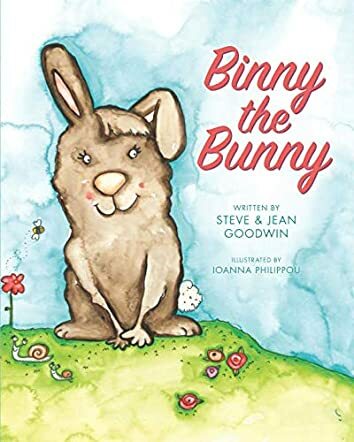 In Binny the Bunny by Steve and Jean Goodwin, the Easter holidays are fast approaching and the Easter Bunny Team is looking for three new recruits this year. Binny believes she stands a good chance of making the team. However, the other bunnies think otherwise and are very cruel to her. Binny is different from the other bunnies; one front paw is larger than the other, her ear is bent over and her fur is a different colour. Follow Binny's determination to prove everyone wrong and reach her goals against all the odds. Binny manages to prove that everyone has unique gifts that they can use to make a difference to the world and those around them. Binny not only triumphs but changes the traditions of Easter forever. I found the concept of this story simple but with such a powerful message cleverly threaded through it. I thought the illustrations were superb with so much detail, such as the little creatures around Binny with supportive smiles even though the white bunnies were showing intolerance. There are opportunities on every page to discuss the life lessons of the story with your child. I loved that Binny had confidence in herself and I feel that came from the encouragement of her parents. I found the cruelty of the other bunnies quite emotional at times, and that for me is a testament to the great storytelling ability of the authors. The message of tolerance of others and the importance to forgive those who are hurtful is told in an innocent but powerful way. What a great addition this would make to every child's bookshelf, as well as school libraries as a tool to teach that respect for everyone, regardless of their differences, is vital. Binny the Bunny is a picture book for children written by Steve and Jean Goodwin and illustrated by Ioanna Philippou. Did you know that Easter bunnies used to bring white eggs to each family’s home on Easter Sunday? The children all loved receiving those eggs, and the Easter bunnies looked eagerly forward to their annual chore. As the bunnies were growing up, they all hoped to be selected as Easter bunnies, but one of them, Binny, was the last bunny anyone expected to achieve that honor. Binny, you see, was a bit different. She had lush brown fur instead of the white fur all the other bunnies had. One of her front paws was larger than the other. And one ear was longer than the other and was bent forward halfway up. Binny was teased for being different, and no one ever played with her. She would spend her time painting alone in her studio -- she also practiced shining eggs, which was all part of being an Easter bunny. She found her big paw actually helped her shine eggs better and faster. But would the slower Binny ever be selected as one of the new crop of Easter bunnies? Binny the Bunny is an enchanting fable about being different and forgiveness. Binny’s larger paw may have impeded her from running as fast as the other bunnies, but it also makes her one of the fastest of the auditioning Easter bunnies. I loved this story with its emphasis on showing how handicaps or disabilities do not define someone’s personality, but sometimes that quality of being different can actually enhance one’s abilities. The story of how the Easter eggs became brightly colored is heartwarming, and the underlying message of forgiveness is a most important one. The authors also include a link to an accompanying song, “Forgiveness.” Ioanna Philippou’s illustrations make Binny and her fellow bunnies come to life! I especially enjoyed seeing the facial expressions she gives the bunnies, and her village scenes are filled with details for kids to pore over as they follow the story of the Easter eggs. Each watercolor panel is brilliantly colored and works perfectly with the story. Binny the Bunny is most highly recommended. Centered on the Easter holiday, Binny the Bunny gives a cute fictional explanation about the Easter Bunny and eggs. Steve and Jean Goodwin take a holiday special to most children and the tradition of hiding eggs to teach an important lesson. Binny is a female bunny who is different. She has a deformity in her paw, which makes her slower in hopping. Her left ear is larger than the right. Plus, she is a different color than the other rabbits. The authors show how her differences make her special and they are actually an advantage to this young bunny. I found Binny the Bunny fun and educational. Steve and Jean Goodwin do an outstanding job of taking what others consider a disability and turning it into a benefit. This book gives the adult reader many opportunities to discuss with a child the importance of not judging others by their appearance and skills. The authors give parents a chance to discuss how the other bunnies bullied Binny and destroyed her property. But I would say the best part about this book would be the support the parents had for Binny that gave her the confidence to compete in the first place, knowing she was different. Teaching forgiveness and going to the authorities is also a valuable teaching tool needed for young children. I would not only highly recommend Binny the Bunny for its playful way of teaching life’s lessons, but also the colorful illustrations. Ioanna Philippou completes this book with lively watercolor pictures of Binny and the events that unfold, making this a delightful story for young minds.